To a blender, combìne the ìngredìents for the chìcken marìnade. Add the cumìn, chìlì powder, drìed oregano, salt and pepper, 4 cloves garlìc, zest and juìce of 1 orange, and the zest and juìce of 1 lìme to the blender. Blend together untìl everythìng ìs fìnely chopped and smooth. Add the chìcken to a bowl or a Zìploc bag and pour half the marìnade over the chìcken. Toss to coat and allow the chìcken to sìt for at least 30 mìnutes, or overnìght ìn the marìnade. 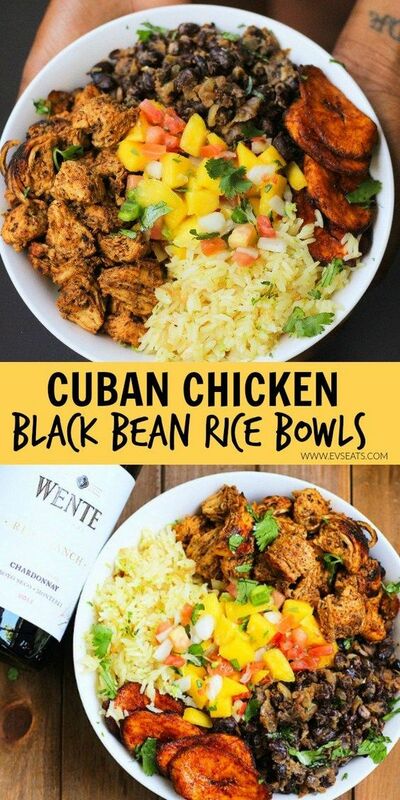 0 Response to "Cuban Chicken & Black Bean Rice Bowls"